Another police officer, S.P. Pani, said firefighters were at the site in Budgam area where the Indian warplane crashed. In a press conference in Islamabad earlier today, Pakistan military spokesperson, Major General Asif Ghafoor, said the Pakistan military was not responsible for the crash. Pakistan has denied this claim and said that there were no casualties. 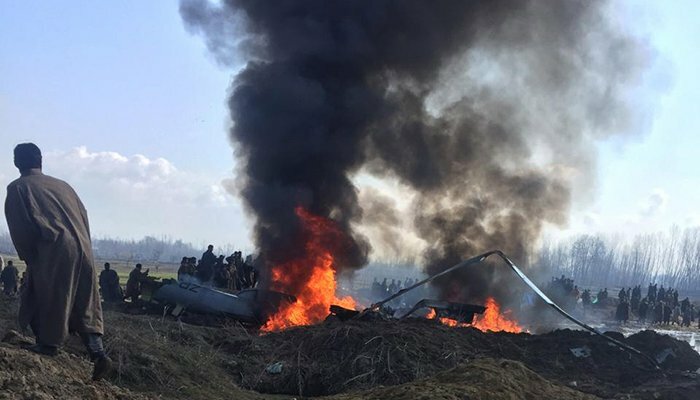 Meanwhile, on Wednesday, the IAF jet crashed in Naslapur area of Budgam district in Jammu and Kashmir. The Taliban have said they have "deep sympathy with the government and people of Pakistan" after India's military action. With all Indian establishments put on high alert in view of possible air space violation by Pakistan, the Indian government made a decision to shut the air space for commercial and civilian flights. "Two Indian pilots were taken into custody and they are being treated well". Locals rushed to the spot and video-graphed the incident on the mobile phones. Earlier, the entire airspace north of the Indian capital was vacated, official sources said on Wednesday. Indian forces are on high alert to give a befitting reply again for any Pakistani retaliation. The reports further stated that one of the deceased persons has been identified as Kifayat Hussain Ganaie. Officials say that the aircraft was 50 years old and was from the Awantipora Air Force Station. The reaction came after Indian aircrafts intruded into Pakistan airspace and released payload in haste near Balakot. Several airlines issued statements about the cancelling operations. The conflct in the region escalated after India bombed militant camps in Pakistan yesterday - camps Pakistan claims do not exist.